Since I've joined the caving community I've heard many times where cavers refuse to be called spelunkers because of the history of how the word was used in the past. But I'm starting to wonder if it isn't time to embrace the word. I don't see any current disadvantages and there are some potential benefits. Whenever I mention that I'm a caver people are excited to call me a spelunker. It gives them a sense of knowledge and I see their eyes light up. As cavers shouldn't we try to encourage that light in people's eyes when talking about our subject? We can use that spark of interest to promote conservation, safety, and other conversations. This doesn't negate your proposition, but I find people like it when I explain the difference because they find they're really in the know. I suspect you won't get far with your plea, but maybe. Whenever I mention that I'm a caver people are excited to call me a spelunker. It gives them a sense of knowledge and I see their eyes light up. I completely relate to that. The ones who ask me about it are so excited I sometimes hesitate to tell them I prefer to call it "caving". I guess the word does leave somewhat of a bad taste in my mouth. I am very serious about caving and very serious at becoming very proficient at the sport. Most of the people who teach me in addition to my mentor refer to it as caving, so I adopted it fairly quickly (I think I even remember seeing someone post "Cavers rescue spelunkers" on this forum the night after my first caving trip in Pettyjohn's haha). Whenever we see a sketchy or uncomfortable passage that probably goes nowhere and debate on investigating it, we usually ask "So who's going to spelunk that thing?". caver.adam wrote: I've heard many times where cavers refuse to be called spelunkers because of the history of how the word was used in the past. No they don't. They dislike the term because of it's current connotations among themselves. DawgsgoCaving wrote: I am very serious about caving and very serious at becoming very proficient at the sport. Most of the people who teach me in addition to my mentor refer to it as caving, so I adopted it fairly quickly (I think I even remember seeing someone post "Cavers rescue spelunkers" on this forum the night after my first caving trip in Pettyjohn's haha). I'm a little bit different than Dawgs. I am not very serious about caving. And I feel that the "cavers rescue spelunkers" line is condescending and assumes a lot of negative things about cave explorers that operate outside of organized caving (and gives some undeserved credit to cavers). For this reason, I'll let anyone call me a spelunker and I'll call myself a spelunker, but when conversing with Cavers I won't use the term to describe someone else. Call people what they are for goodness sake. There are plenty of perfectly good verbs and adjectives that we can use to describe a persons behavior and attitude. Using the word spelunker seems quite similar to swearing; It is often used in a moment of emotional surplus or a moment (or culture) of intellectual deficit, and it is usually inadequate as a word to describe anything or convey any meaningful thought. This has of course been done before in this thread. There are many people though who have been exploring caves for decades without any "proper" clothing, or equipment. And they have done so conscientiously, safely, rewardingly... It's just a wee bit comical that we sometimes use the term "caver" to distance ourselves from people who are just as responsible and safe as ourselves... It [gear] is largely a matter of purpose, I think. Don't do things you aren't equipped for... It seems a bit funny that the caving community has changed the meaning of the word without telling the rest of humanity and then proceeds to take offense at being called the by the arbitrarily disfavored term. Being "offended" because the general public doesn't understand our very imprecise bastardization of a commonly accepted and used word makes absolutely no sense to me. I still feel the same way on the matter. And I feel that the "cavers rescue spelunkers" line is condescending and assumes a lot of negative things about cave explorers that operate outside of organized caving (and gives some undeserved credit to cavers). For me it just implies the a lack of respect for the sport. For me, meaning this is just my experience, the people who told me to "Join a grotto and learn about caving" were not the ones who taught me about caving. They're not the ones who are leading me into the deep, dark, wet abyss and recruiting me to assist in digs and push projects. Despite this, lots of them are lifetime NSS members and very active in grottos. I'm not sure what I would call them and I don't really intend on figuring out a term. They're just another subset of the caving community as a whole. That doesn't mean active organized cavers don't do those kinds of trips because I know many who do. Word meanings change. "Gay" used to mean a happy, fun frolic. To the Amish community, the word gay still means frivolous outsider or, as they often term it, "English"...even though all of the English they know tend to be native Pennsylvanians or Ohioans. Likewise, the word "notorious" has changed. We'd say that John Dillinger or Jesse James were notorious criminals. However, in his day, George Washington often was termed "notorious" (as were Thomas Jefferson, etc.). It just meant famous. Today, it means famous for being bad. Part of the caver\spelunker debate, I feel, is the aura it confers on some of being an insider...those who want to feel "in the know" make the distinction -- and I'm often one of them. I think a parallel is our use of the word grotto for a caving club. Telling people you belong to a caving club brings instant understanding; saying you belong to a grotto is simply perplexing (besides, I think there is a certain ring to Cleveland Caving Club vs. my primary, Cleveland Grotto). On the other hand, would most people of a heterosexual bent be apt to tell people they had a gay time with a friend? I like having both words because it is useful in conversation. For example; "were they cavers or spelunkers?" This one happens to me a lot if I'm out hiking and happen to find a cave; "I got a light on my cell phone, lets go spelunking." I just remembered a story of my own related to the topic. 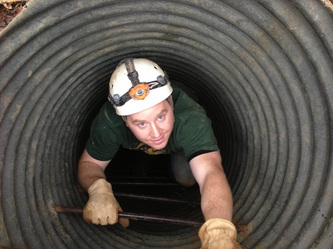 I was talking with a couple of co-workers about caving when they called me a spelunker. After I explained the difference between cavers and spelunkers they practically refused to accept my definition. They were flabbergasted at the idea that we would use our own word for exploring caves when their is already a special word just for it. So Adam I agree that sometimes it can be awkward. That's always bugged me too. I mentioned that I was a caver once to a non-caver. They responded, "you mean a spelunker" in a correcting tone. I felt arguing with them would only make me look like a bit of a jerk. It just seems wrong having "spelunker", a word that shares its root with the name we give the sciences associated with caves, be the word that is also associated with negative connotations about irresponsible cave exploration. To an outsider, the term "caver" would seem to be the less respectful term than "spelunker," even though it's the opposite. In casual conversation, if someone says "spelunker," most times I just roll with it until I can tell they're actually interested enough in the subject to tell them that most people in the caving community prefer "caver". Otherwise, I find it's just not worth the hassle. As an on-topic aside, many legislatures have cave owner protection laws. If you are searching for a particular state's law (https://asci.uvm.edu/equine/law/recreate/recreate.htm is a great place to start), don’t just search for “cave” when looking through the Acts. You’ll find "cave" specifically mentioned in the laws in Pennsylvania, Indiana, e.g. But be sure to look for “spelunking” as well – which is the official term used in Arkansas, Nevada and Colorado amongst others.